Our producer Zebe is here with us for the first week. He will helping to manage our Patrons who have the opportunity to join the show live while we’re recording. He may jump in from time to time to add commentary or help ask questions from the Patron group in Zoom. 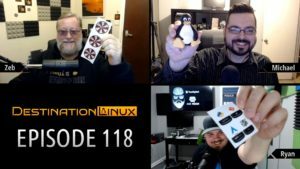 Today on the show we have a special guest Dustin from Ubuntu Budgie. Dustin has been a guest in the past but for our new listeners…..
A very unusual but so far amazing psychological horror game made by Steve Gabry.